Are you a Sales Agent calling on the Health and Beauty sector? 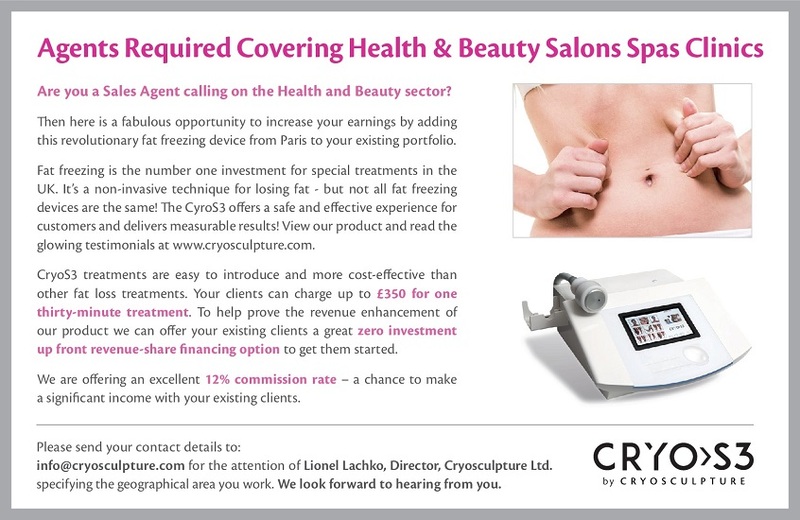 Then here is a fabulous opportunity to increase your earnings by adding this revolutionary fat freezing device from Paris to your existing portfolio. Fat freezing is the number one investment for special treatments in the UK. It’s a non-invasive technique for losing fat – but not all fat freezing devices are the same! The CyroS3 others a safe and effective experience for customers and delivers measurable results! View our product and read the glowing testimonials at www.cryosculpture.com. CryoS3 treatments are easy to introduce and more cost-effective than other fat loss treatments. Your clients can charge up to £350 for one thirty-minute treatment. To help prove the revenue enhancement of our product we can offer your existing clients a great zero investment up front revenue-share financing option to get them started. We are offering an excellent 12% commission rate – a chance to make a signifi cant income with your existing clients.